Banff hotels provide an array of settings with the widest variety of features you could ever imagine. Each of hotel has its own unique settings and characteristics. But all of them have one common thing – they are surrounded by unspoiled wilderness. Regardless of where you stay one thing is certain, given the areas phenomenal natural setting it's very difficult to find a poor view from any room's window. Lots of companies in Calgary, especial oil and gas companies, like to hold Christmas parties in one of the high-end luxury Banff Hotels or Lake Louise Hotels every year. I was lucky to work for one of these companies. We had Christmas parties in the famous “Castle in the Rockies” - Fairmont Banff Springs Hotel with world-class spa, the first-class Rimrock resort with best views of the Canadian Rockies, and Fairmont Chateau Lake Louise with stunning views of the Victoria Glacier and Lake Louise. We had our own wedding in Banff. We enjoyed staying in first-class cozy and woodsy Banff Buffalo Mountain Lodge, my in-laws family members (4 of them) stayed in one of the fully equipped kitchen two-bed room loft suites of Tunnel Mountain Resort Banff, which is perfect for families. They wished they could stay longer. My brother was satisfied to stay in a room with a mountain view balcony in Park Lodge Banff with 4 star- full service and good value for the money. During ski season, we like to stay at Sunshine Mountain Lodge / Sunshine Inn Banff – The only Ski-in and Ski-out mountain lodge. It locates right at the sunshine ski hill, 7082 feet high. These hotel rooms include a daily lift ticket for each guest, as well as the convenience of cable TV and Internet access (surcharge). Staying there while skiing, it saves us time to line-up to take the gondola from the bottom to the top of the ski hill. Another benefit is that we can walk to our hotel room to have a cozy break in the middle of skiing. 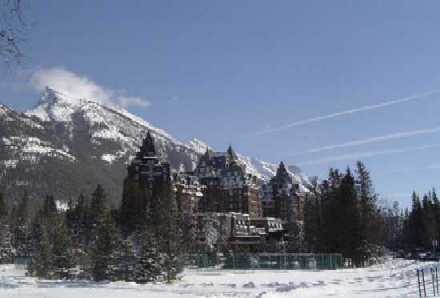 There are large numbers of Banff hotels to choose. To make your life easy, besides the hotels I stayed, I will list other nice Banff hotels. Fairmont Banff Springs Hotel – The one of most famous buildings in Canada - one of my favorite Banff hotels to visit and stay. If you do not want to stay, you MUST see – trust me! Click here for more. Banff Buffalo Mountain Lodge – A mountain lodge in the truest sense, where we stayed for our wedding. I love it. Click here for more. Rimrock Resort – luxury, harmony, and nature beauty all rolled into one, outstanding view and a classy and welcoming atmosphere. It is a good choice for families who are not on a tight budget. Click here for more. Fox Hotel & Suites - Waterfalls and mountain springs are brought to life in this brand new hotel design. The Fox features Rundle rock stonework and mountain spring hot pools inspired by Banff's original Cave & Basin site. My kids (3 and 8 years old) loved the cave basin hot tub/pool atmosphere. The creative layout of the Fox Suites will offer a quiet respite after an adventurous day, with Chili's as the hotel restaurant and Banff dining and nightlife only minutes away. Even though these upscale hotels are expensive, I still think it is worth it to experience one of the high-end hotels in Banff National Park. Caribou Lodge – comfortable and reasonably priced with log furniture and rustic design. One of our favorite ones. Click here for more details. Tunnel Mountain Resort Banff – great luxury, friendly place with great value for families and groups of friends. They offer condo units and chalets. The playground and indoor swimming pool are fun place for kids. My parents-in-law stayed in one of the loft suites and they loved it. Brewster’s Mountain Lodge – quiet and peaceful western-style hotel right in the middle of the busy Banff shopping area. It is a good choice for active people who want to be close to the action. Ptarmigan Inn – with quite reasonable rate, enough class to make it special, and excellent location ( one block from the heart of Banff downtown), it is a good middle-range choice. Some of you might think it is noisy because of the busy location. But only a few of guest rooms actually front onto the busy main street, so most are quite. Banff Aspen Lodge – walking distance to shops, restaurants, galleries, and museums. Friendly and helpful staff, complementary exceptional delicious breakfast. Mount Royal Hotel Banff – Historic hotel with features a spa tub, a sauna, and a lively pub with a big-screen TV, darts, and billiards. Charlton's Cedar Court - This newly renovated property has a saltwater indoor pool, whirlpool and steam room. Whether it’s a fun family break, or a pampering retreat, the Charlton’s Cedar Court 3 1/2 star Canada Select property is a perfect choice for a memorable vacation. Situated just 10 minute’s walk to the downtown, this property offers a unique selection of accommodations including family-friendly kitchenette suites, and romantic loft fireplace suites. Rundlestone Lodge Banff – The sloped roof, logs and rundle rock set the scene for a romantic getaway in the Canadian Rockies. Rooms are tastefully decorated and reflect what you would expect from a modern mountain lodge. Banff International Hotel – Conveniently located on Banff Avenue, the "main street" in town, Banff International Hotel is within walking distance of restaurants, boutiques, and the outdoor paradise that is Banff National Park. Banff Rocky Mountain Resort - located located at the base of Mount Rundle and Cascade Mountain, four kilometers from downtown of Banff. Their condo units / suites with full kitchen and fireplace are great for families. Sunshine Mountain Lodge ( formally known as Sunshine Inn Banff) - A only ski-in and ski-out hotel in Banff. It is nestled in the centre of Sunshine Village ski area at 7200 feet and accessed via a high speed gondola, this lodge provides a high altitude respite from the crowds of Banff. 3200 acres of skiable terrain greet you outside your room window, and over half of Sunshine Village's lifts are within walking distance of the lodge's front door. I think this lodge on the ski hill is a top choice for people who want to do winter sports such as skiing and snowboarding. I do not think this hotel is good for people who are looking for amazing honeymoon, romantic gateway, not for older travelers, families with young children, people with disabilities. There are limited amenities. There are lots of other Luxury Banff hotels we haven't visited them all yet. But these listed above are ones which I can vouch for. I'm pretty sure you'd be happy with these. We are still exploring more. Please watch more places to go and more Banff hotels to stay, more things to do and more experiences to enjoy will be added to this guide. We are updating our Banff Discovery Guide site whenever we discover anything new. If you want to stay in Lake Louise, Click here to find a right one for you.